Malai Kofta: Malai Kofta is an exemplary North Indian dish started from the Mughlai food. Malai alludes to the cream and koftas are pan fried paneer and vegetable dumplings in rich and velvety tomato sauce. It is a rich dish ideal for gatherings and exceptional events. It goes well with chapati, naan, jeera rice, all pulaos and parathas. Take all the ingredients mentioned under kofta ingredient list except oil, in a bowl. Make 12 medium equal sized balls with the mixture. Heat the oil, for deep frying, in a pan on medium heat. Fry the mixture balls in the hot oil till golden brown in colour. Remove extra oil from the same pan and keep about 1 or 1.5 tbsp oil. Add all the whole spices to the oil. Fry till the oil becomes fragrant. Add in the onion paste and brown it. Fry for few seconds till the raw aroma of the paste goes away. Add in the tomato puree. Add in the turmeric powder, red chili powder, garam masala powder and cashew paste. Stir and saute till the oil starts to leave the sides of the masala paste. Simmer till the gravy begins to thicken which takes about 10-12 minutes on a low flame. Season the gravy with salt, sugar and add in the dry fenugreek leaves. Simmer for 1-2 minutes more. Add in the fried koftas in the curry. Malai Kofta is ready to be served. Garnish the malai kofta with some cream, grated paneer and coriander leaves. 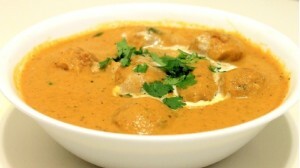 Serve malai kofta hot with chapati, naan, jeera rice, all pulaos or parathas. If you have any queries regarding the Malai Kofta recipe, please leave a comment.